A tracing is a stone which may look like a rectangle not a square as shown above. When building a dry laid stone construction one should avoid this when possible. 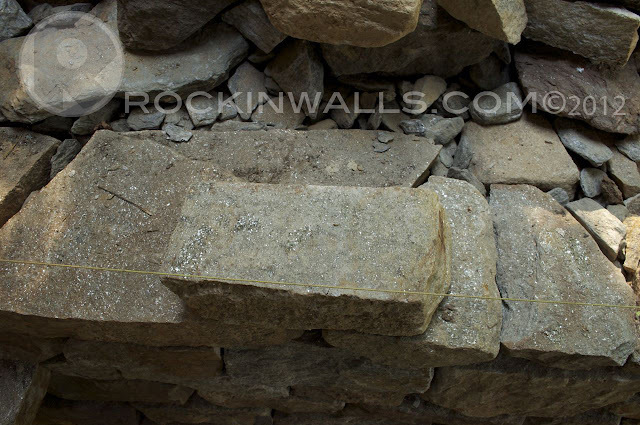 You may use a tracing stone if it happens to run half of the wall width making good contact with the stone behind it. But repeated practice of tracing stones may weaken the structure of the wall. In some areas of United Kingdom this is a common building practice. Some stone maybe to large to make smaller. The above shows the best solution for a stone such as a rectangle. Placing the length into the wall will make a dry laid stone construction more likely a sound structure. 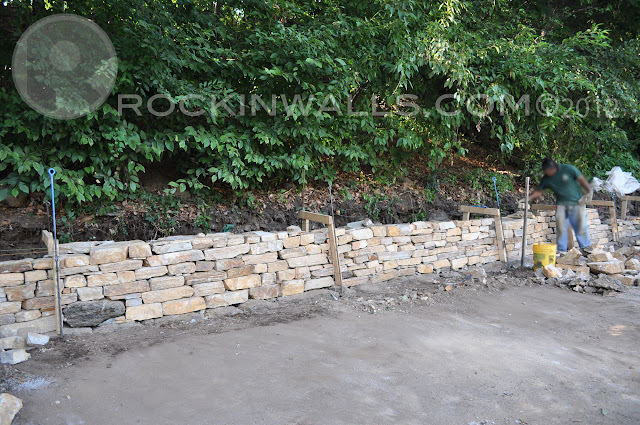 In addition with the other basic walling principles. 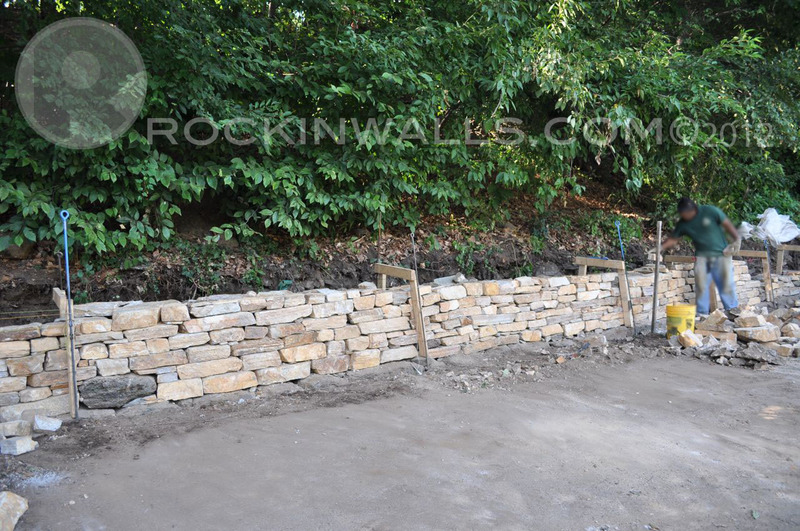 This Dry Stone Mason - new to the craft wanted to gain a quick length of wall per day. By picking and placing tracing stones he gained length fast. Building in 6' sections. Can you spot his section with the longest larges stones? Look at all the sections - notice what looks to be the average size of stones on the job. 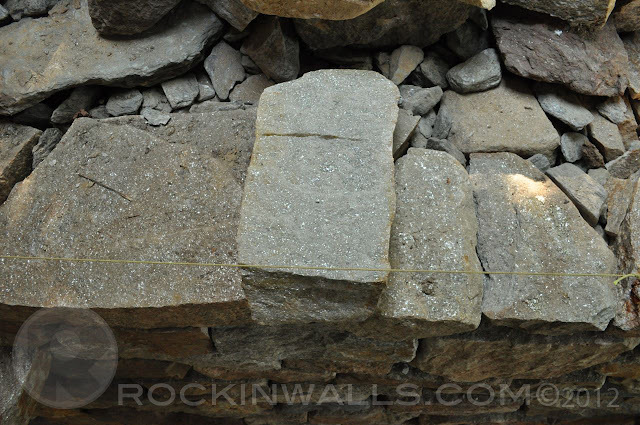 I have seen a great deal of dry stack stone walls with tracing in my area built by wet masons. They are using the same practice if they were building with mortar in order to get the most face out of the stone. This maybe be ok when using mortar. This is not correct for a dry laid stone construction! 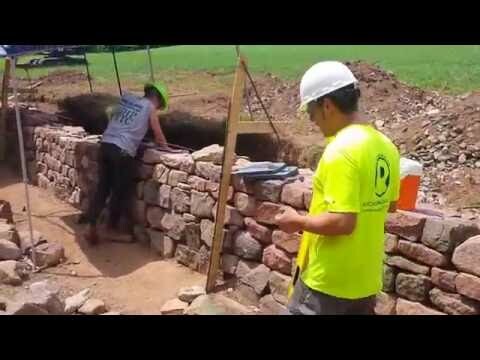 Moral of the story if you live in the USA and someone is building this way (a full wall or more then a handful of stones/unless this is the best use for the stone)- question them? Maybe fire them and hire someone who knows a little more about Dry Laid Stone Masonry. In this day and age with the internet, workshops, Ebooks, books, blogs, websites, YouTubes - I'm still shocked at those in the industry such as Masons and Landscape - who still have no clue. There is no excuse! Do what you do and do it good. Don't make excuses for crappy work. Build it right the first time so someone else doesn't have to come back and repair it a second time. Notes: Rules are always meant to be broken. Just not all the time. You be the judge of when a tracer is ok.
Keep spreading the message. Single skin 8" cut wall tracers are the norm here. Look OK for a year, then begin to fall in on themselves. It is hard to compete pricewise. Thank you Neil, I just spotted another "professional" landscape company - every natural stone wall they built was Tracing.... out in WI. They seem to do some nice work with a great web site. But I think they missed the article about how to properly build a structurally sound dry laid stone wall. You wonder why the industry feels the building practice doesn't last? Yes because you don't hire a plumber to build a washing machine. Your right the consumer doesn't know what to look for- they think its right since they hired a company do the job. Not understanding why your bid was twice as much. To bad - I just hate seeing consumers getting ripped off! But that's ok I started this blog to help persevere and promote the craft. When will you send some pictures of your roof thatching?